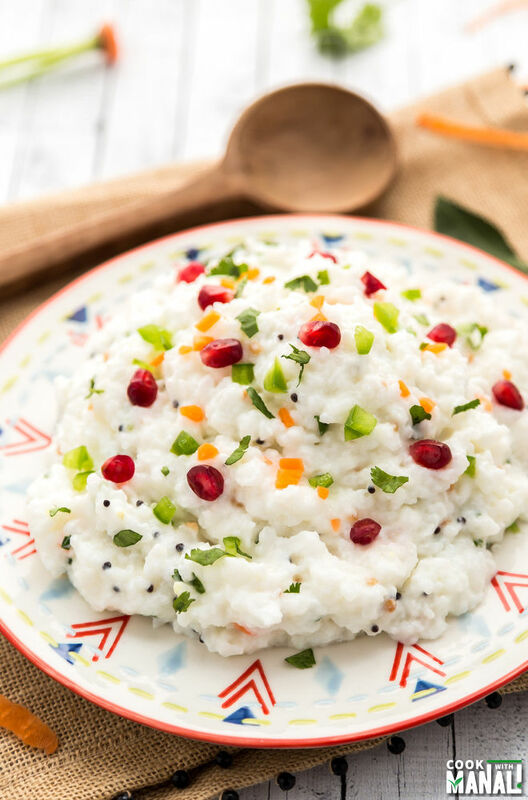 Comforting Curd Rice is a popular dish from South India where soft cooked rice is mixed with yogurt and then tempered with spices. 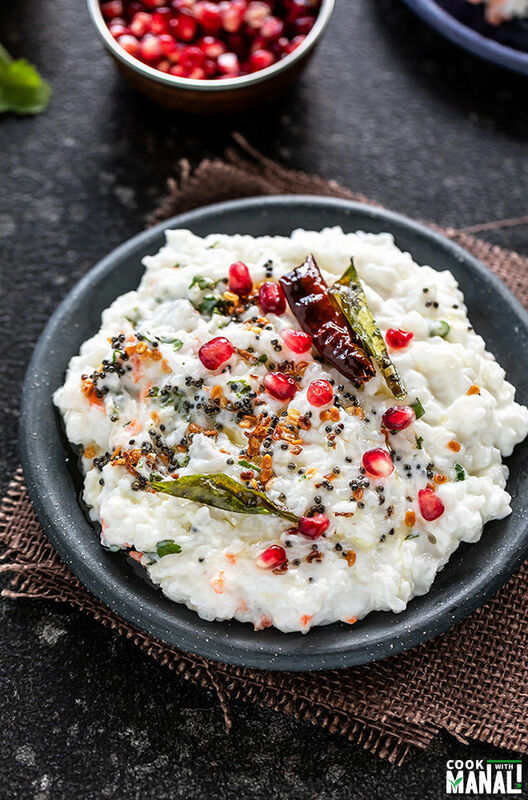 The curd rice is easy on the stomach and tastes great with a side of pickle and papadum! What is comfort food to you? For some it’s a bowl of noodles or mashed potatoes or chili. For me it’s dal-chawal, which is basically nothing but rice and lentils. Trust me nothing beats the taste and aroma of rice and dal with some ghee on top. I’ll take it any day over all the fancy food and that’s why I say we all might like to eat different things but after some time the body craves for that comfort food. Isn’t it? 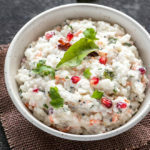 One such popular comfort food from India is Curd Rice, where rice is mixed with curd (yogurt) and then seasoned with spices. I didn’t grew up eating curd rice because this dish is from South India but over the years it has definitely become one of my favorite things to eat. Whenever I feel like eating something comforting and easy on my stomach, curd rice is my go to option. This dish is a part of every special occasion in South India, the cool yogurt perfectly balances out all the spicy food. 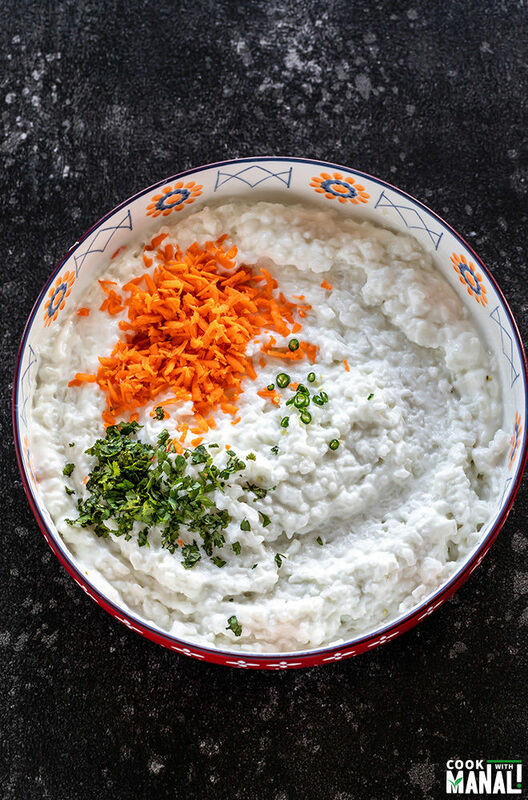 The process of making curd rice is pretty simple and straight forward. First the rice is cooked with more water than you normally would. Because the rice is cooked with extra water, it’s quite soft and that’s the consistency you want for curd rice. I have used long grain white rice in this recipe, you may use short grain or basmati. Even brown rice would work. Once the rice is cooked, you have to let it cool down completely. And then add in the yogurt (I add a lot of it!) and milk. Adding milk is optional, but I add it for the consistency and flavor. Some people also add in butter to their curd rice for that extra creaminess. However I generally keep it simple without the butter. 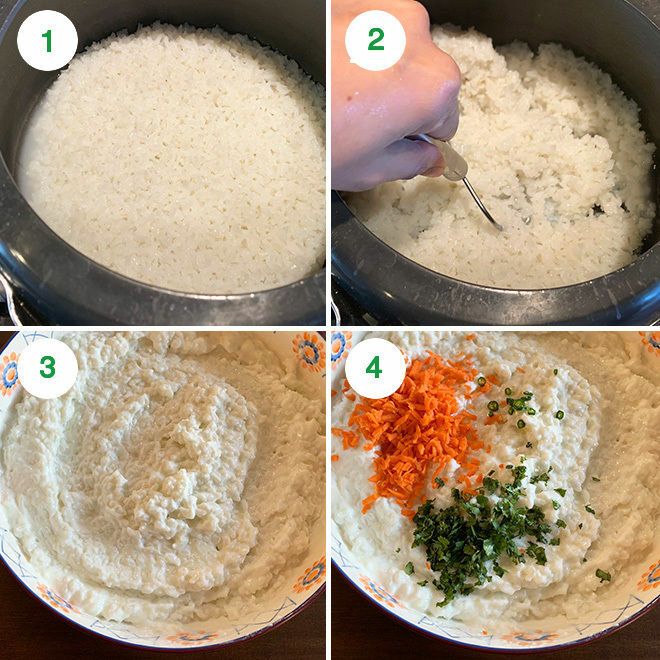 After the yogurt is mixed with the rice, the next step is so add any veggies that you would like. I know some people keep is super simple and add nothing at all. So then it’s just plain curd rice with a tempering of mustard seeds and curry leaves. I have added grated carrots, cilantro and green chilies to my curd rice. You can also add green peppers or cucumber to it. And like most of the Indian recipes, a tempering in the end is must! 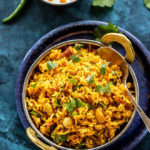 Tempering or tadka refers to the process of adding seasoning to the dish in the end (or the beginning) and is an integral part of Indian cuisine. For the tadka, I used mustard seeds, curry leaves, urad dal and dried red chilies. I also added some ginger for that extra taste. 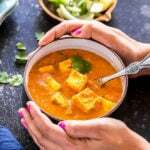 You may also use chana dal, cumin seeds or asafoetida (hing) in the tempering. There’s no hard and fast rule so use what you like. Personally, I really like to chill the curd rice before serving. Firstly, because I think it tastes so much better when it’s chilled. And secondly, those extra hours while it’s chilling it the refrigerator gives the time for the flavors to mix in together. So it just tastes better overall! 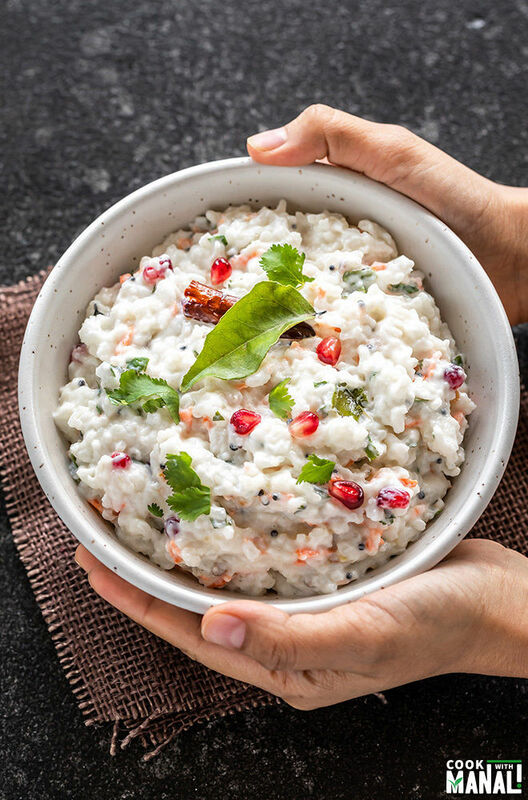 Once the curd rice is chilled and ready to be served, place it in your bowl or plate, garnish with pomegranate seeds or grapes and serve with a side of pickle and papadum. You may also add in some chopped cilantro on top. Sarvesh would not eat his curd rice without the pickle ever! 1- Rinse 1 cup of rice and place it in a pressure cooker with 3 cups water and 1/2 teaspoon salt. Pressure cook the rice until very soft- 2 to 3 whistles on high heat then lower the heat and cook for additional 2 to 3 minutes. Let the pressure release on its own. 2- Once the rice is cooked, mash it a little using a masher or back of a spoon or using your hands. You may also leave it as is if you don’t like mashed rice. Transfer rice to a large bowl and let it cool completely. 3- Once the rice has cooled completely, add in the whisked yogurt and milk and mix to combine. I add around 2 cups of whisked yogurt because I like a lot of it, you can adjust to taste and reduce the quantity. 4- Then add in the grated carrot, chopped cilantro and green chili and mix to combine. 5- Now for the tempering/tadka, heat oil in a small pan on medium heat. Once the oil is hot, add the mustard seeds and let them pop. 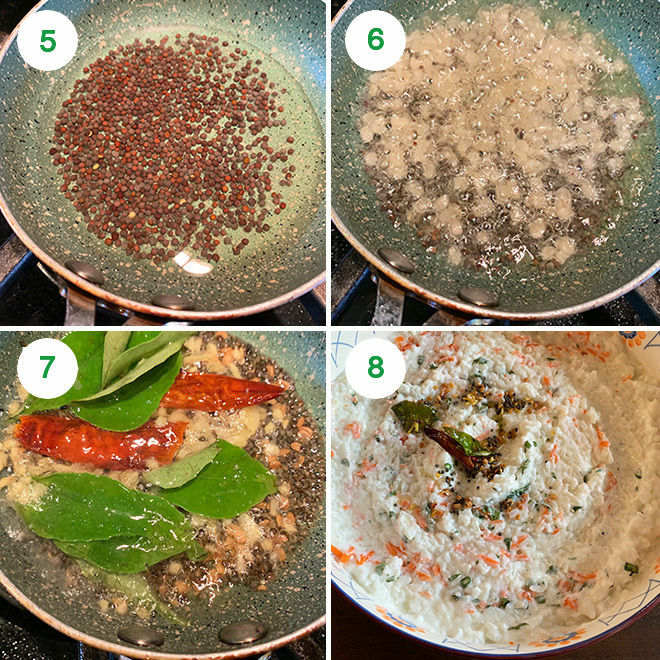 6- Then add the urad dal and cook until it starts changing color. (Tip: if you want dal to be soft and not super crunchy in the tadka, just soak it in water for 10 minutes before using in the recipe). 7- Add the ginger, curry leaves and dried red chilies. Cook until the curry leaves turn crisp. 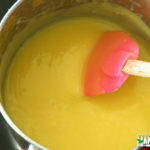 8- Transfer the tadka to the bowl of curd rice and mix. Cover and refrigerate the curd rice for few hours until chilled. Then top with pomegranate arils (optional) and serve with achar and papadum. 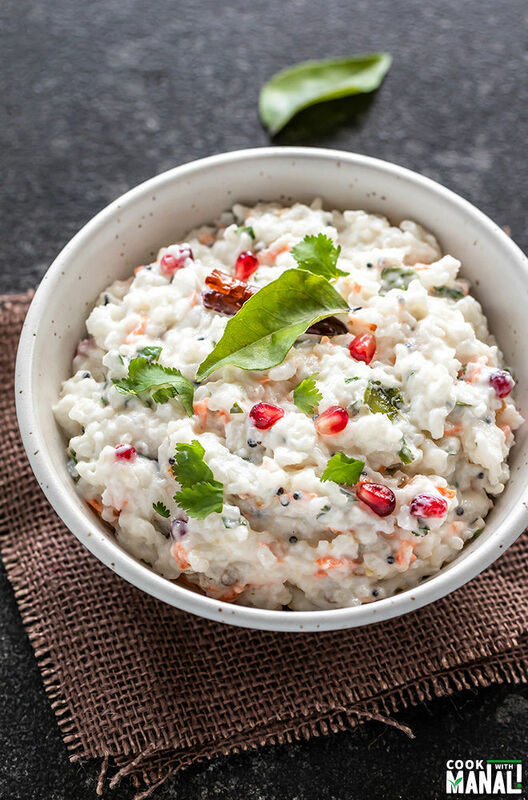 If you’ve tried this Curd Rice Recipe then don’t forget to rate the recipe! You can also follow me on Facebook and Instagram to see what’s latest in my kitchen! South India's ultimate comfort food where soft cooked rice is mixed with yogurt and then seasoned with spices. Tastes best when chilled and with a side of pickle and papadum! Rinse 1 cup of rice and place it in a pressure cooker with 3 cups water and 1/2 teaspoon salt. Pressure cook the rice until very soft- 2 to 3 whistles on high heat then lower the heat and cook for additional 2 to 3 minutes. Let the pressure release on its own. Once the rice is cooked, mash it a little using a masher or back of a spoon or using your hands. You may also leave it as is if you don't like mashed rice. Transfer rice to a large bowl and let it cool completely. Once the rice has cooled completely, add in the whisked yogurt and milk and mix to combine. I add around 2 cups of whisked yogurt because I like a lot of it, you can adjust to taste and reduce the quantity. Then add in the grated carrot, chopped cilantro and green chili and mix to combine. Now for the tempering/tadka, heat oil in a small pan on medium heat. Once the oil is hot, add the mustard seeds and let them pop. Then add the urad dal and cook until it starts changing color. (Tip: if you want dal to be soft and not super crunchy in the tadka, just soak it in water for 10 minutes before using in the recipe). Add the ginger, curry leaves and dried red chilies. Cook until the curry leaves turn crisp. Transfer the tadka to the bowl of curd rice and mix. Cover and refrigerate the curd rice for few hours until chilled. Then top with pomegranate arils (optional) and serve with achar (pickle) and papadum. You can add fruits & nuts to the curd rice as well. Cashews, peanuts, mangoes, grapes will all taste good here. Use little butter for a creamier curd rice. I like it simple without the butter. I’m a noodle gal while my hubby loves rice. We try to divide both equally between our meals so neither of us feel deprived. He would love this this dish for sure. Pinning! Thanks for the pin Jen! Trust me nothing beats the taste and aroma of rice and dal with some ghee (clarified butter) on top. ^^ yes yes yes that’s my favoriteee comfort food!! I am sad that I didn’t bring lentils to school with me, haha because it’s just the best. This curd rice sounds amazing! I remember we used to always get it from the temple and it was delicious! What a gorgeous dish, Manali! I love the addition of pomegranate seeds, makes it so colorful! And I agree, this definitely looks like a true comfort food dish. Pinned! 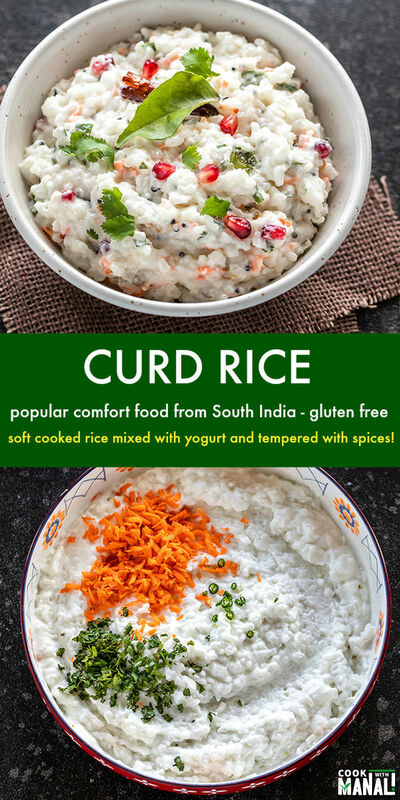 I’ve never tried curd in rice before but it looks like the total comfort dish! Love the ginger, coriander and green pepper and the addition of pomegranate seeds sounds wonderful! I love rice and have been eating a lot of it lately! 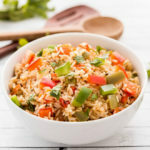 This rice dish looks delicious! Love the addition of butter! With all the spices on top it is something I would definitely try soon! This looks amazing, Manali! 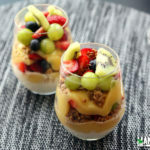 I really like Indian desserts, so with all those spices and other great flavours this would for sure be a recipe to try! Thanks Jessica! 🙂 though this isn’t a dessert.. I love rice, but haven’t tried curd rice yet. This looks like total comfort food! These pictures are gorgeous too! Thanks Savita…me too always a fan! even though I’m not a rice fan in general but I love curd rice! You have not shared much with us about tofu recipes. It would be nice to know a few of them. Thank you. 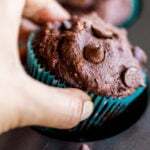 Is there any specific recipe you are looking for? Let me know! 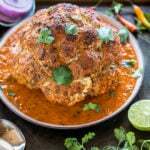 Thank you Manali for this wonderful recipe, my family loved it! It’s our go to comfort food. 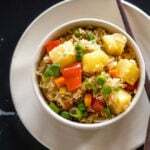 I also made your Upma recipe, so amazingggg!